‘A monsoon night, lots of rain drops everywhere on the earth and air’ - She loved this weather. It was a respite from the hot months of summer. Aakanksha picked up her laptop bag and headed home from her office. She had been working late for the past few weeks. Today finally the deadline was met. She looked at her mobile - it was way past 10 in the night. Her mobile made a feeble beep once - low battery. She needed to recharge it as soon as she reached her flat. Flat -- empty and flat but her flat nevertheless. Nearly all the employees had left the office. She switched off the light of her floor. It was not needed and she hated wasting electricity. It was a precious resource even though most of the people around her didn't bother. But this is what her dad always told her - "Save power, save earth". “Her dad” - not just her father but also her role model. She was so much like him. She wanted to call him and say she missed him but she couldn’t. Her phone beeped once again, it would die soon. She got into the lift and went down to the office reception - it was dark outside. The grey clouds had hidden the moon. A sole street light was shining feebly in the parking area. She stopped for a few moments in the porch. The rain had become less forceful. She looked towards the parking area - her car was standing alone in the parking just the way she was in the porch. A few minutes later the rain had turned into a drizzle. She ran towards her car with the laptop bag swinging on her shoulders. The car felt so warm after the chill outside. She closed her eyes and said a line of prayer before starting the engine. She always did that. Her dad had taught her that. He always said it signaled God to take care of us during the journey. Her house was just ten minutes drive from the office. There was no traffic on the way - who would be driving around in the rain at that hour. She thought about her home and family. They didn’t stay very far - just 200 kms from Bangalore. But nevertheless they were away. She always thought about her family when she drove. It gave her peace - her mother's smiling face, her sister's twinkling eyes and above all her dad's soothing voice. They were a happy lot. She drove slowly in her apartment parking and let the ignition die. Just one hour to midnight and she hadn't had dinner. Her cook was on leave. Normally her cook would come late evening and cook for her. She used to scribble the menu on the magnetic writing pad that stuck on the fridge. She was welcomed in her house with the aroma of tasty food daily. But today, there would be none of that. She had a big two bedroom flat on the 10th floor that she had bought a year back. Infact her parents had forced to invest into real estate. She pressed the lift button - the display showed 13th floor. She waited for the down arrow to emerge on the display. A good two minutes later, she pressed the button again - still 13th floor. 13th was the topmost floor. Rich people had bought penthouses there. There were always stories moving around them and their lives. They were the spice of this apartment. A few days back on one of the weekends her maid had mentioned that somebody had jumped from the 13th floor. Aakanksha didn’t believe her but it was interesting to hear the juicy gossip – an interesting time pass. Finally the down arrow appeared and a few seconds later the lift door opened. She stepped inside - it smelled strange and familiar. But she didn’t know anybody in the apartment. Somebody had already pressed 10th floor. The lift started moving slowly as if crawling to the finish line. Her head had a dull ache - the continuous staring at the computer screen had exhausted her senses. How she longed for her dad made coffee. Her dad was an expert cook. Her mother always said that it was her dad's cooking skills that had first impressed her. A smile escaped her lips. It always did whenever she thought about her parents. The lift was still at 7th floor and it was not moving. No arrow sign. She pressed the 10th floor button again. Was she stuck in the lift? She waited for eternity, panic creeping slowly into her nerves. After what seemed like a lifetime, she saw the down arrow emerge and the lift raced downwards. "Was she having a free fall?" She panicked and frantically pressed the emergency button. But of course as expected there was no response - there was never ever an emergency in this country! She clung to the steel rod that ran across one of the walls of the lift. Within a few seconds the lift slowed down to her respite and stopped at the 2nd floor, but it didn’t open. She slowly released her grip from the steel rod and again pressed 10th floor. The lift was so dimly lit, she could hardly see around. Thankfully the lift was now moving upwards. Finally it stopped and this time the door opened. She stepped out quickly drenched with sweat on the cold night. There was no light outside, just a hazy glow from some source of light far away. right. It was her floor. She wanted to jump with delight even though she was a bit scared. Desperate to get inside her house, she put the key in the door lock and moved it anti-clockwise. The key didn’t move. She took it out and checked if it was the right bunch. It was the perfect key. She tried again. The key didn’t move yet again and now it got stuck in the lock. She just let it be - she was too tired to try again. She sat on the stairs beside the door and pressed her temples with her hands. The dull ache was now a throbbing pain. A few minutes later she again got up with renewed hope. Instead of trying to move the key, she banged on the door. It flung open and she nearly tripped inside her drawing room. "What the hell" she said irritated. How could she forget to lock the door in the morning? - She wondered. Her house smelled like her home - the home she had left around ten years back to come to this city for work. She was a bit calm now. The next agenda was dinner or may be just coffee. She had heavy snacks in the evening. She could skip dinner, but skipping coffee after all this stress was near to impossible. She entered her kitchen. The kitchen light was already on. May be she had forgotten to switch it off too in the morning. Her kitchen was tidy - as always. It was clean because she didn’t have many equipments in the kitchen, just a gas and a filter coffee maker. The coffee maker was standing proudly on the kitchen slab near the window - a few drops of water trickling down from the lid. She had not used it for the past one week. May be the rain drops had swayed inside from the window. 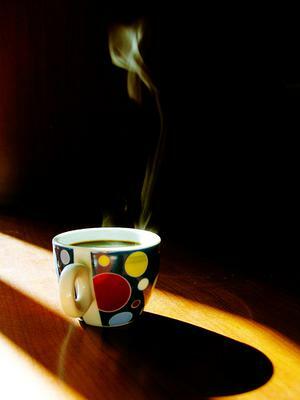 But she could smell coffee - that smell which she could never forget – the smell of the coffee back at her home. She closed her eyes and took in the aroma again. May be she was imagining this - she thought. But the smell was very much there. She looked around - there it was! A nice neat mug of coffee on her breakfast table - waiting to be held. She removed the coaster from the top and smelled it. It was hot - the perfect hot. She sipped it - the same taste what her dad always used to make. The taste which she had been craving for since the last two years, when her dad had left for his consignment in Drass, Kashmir. She hadn’t even talked to him for the past six months. He was an army man - disciplined, warm and a gentleman. She loved him. She went to the other rooms just to check if he was here - there was not a single trace of anybody having visited her home, except that mug of coffee that shouted loud about her dad's presence. "Who was here?" - She thought. There was an eerie silence. She replayed all the incidents today right from the time she left her office. A shudder ran through her body. She took out the mobile from her hand bag. A silent blank screen stared back at her. Her phone was discharged. A loud noise came from the kitchen - she raced towards the sound. The kitchen window had shut with a bang may be due to the wind. She was now really scared. Strange things were happening around her. She felt suffocated and needed fresh air. She opened the main door and stepped out. The lift lobby was well lit now. She could see muddy shoe marks starting from her door - up the stairs. Though it was dark when she had entered her house earlier - but it was not that dark for her to not notice these marks. They were certainly fresh. With great courage she followed them. They went all the way up - past the posh 13th floor and up to the terrace. She opened the terrace door hesitantly. It slid open wide to a dark terrace. She could imagine unknown creatures lurking in the dark nook and corners. She didn’t want to step on the terrace - it looked menacing. She turned back. Somebody grabbed her. Her breath stuck to her throat and she wanted to scream. No, somebody was trying to hug her from behind. She turned with a jerk and came face to face with a known face - It was her sister!!! Suddenly the terrace was illuminated bright and she could see her family and friends all clapping and shrieking with joy! "What?" she was relieved but her heart raced. "Hey we wanted to give you a surprise!!" her mom said. She was standing with her neighbor Ankush, her best friend. Ankush's family was also an accomplice in this. "And also to take revenge for the prank you played on me last year! Remember you nearly gave me a heart attack!!" - Her sister literally jumped with joy - having succeeded in her plan. "Everything right from your car lights to the coffee mug was artfully done by these two naughty kids" - Her dad pointed to her sis and Ankush. "I don’t have any hand in all of this" - he explained grinning ear to ear. He looked good after all these years. Aakanksha moved towards him. "And the coffee?" - She asked him. "You can always count on that!" her dad hugged her. His hug was warm and reassuring. She felt safe now. A delightful story Ritu, You have really taken the reader for a ride. First I thought it was about a girl working in call center and the pitfalls she faces in her life. But then it looked as if her papa had died and come as a ghost. The suspense was very well maintained. I am so happy about the very happy ending. incidents and happenings from an uncommon angle. Where from you got it? Inherited,I suppose. Hey... Great Effort!! I enjoyed reading it.. Plz keep writing. Read this in one breadth , actually was visualizing you and then in between felt like a horror story , but then end was a surprise indeed ! Very well written - Keep it up !! waiting for many more from you . Interesting story. As I read on and reached the part in the lift, I thought this is a ghost story, and at one point, I felt a cold shiver run down my neck. But the end, that was a surprise. This was a really great piece. Surprising ending. Keep it up!